Welcome to another edition of #ProgressiveEats, our virtual version of a progressive dinner party where each course is held at a different home. With Progressive Eats, a theme is chosen each month, members share recipes suitable for a delicious meal or party, and you can hop from blog to blog without putting on a coat! This month’s theme is A Vegetarian Thanksgiving hosted by Susan Pridmore of The Wimpy Vegetarian. You’ll love all the recipes that this amazing team has come up. From a delightful dip to serve before dinner, to main courses, side dishes and desserts, there is something for everyone at your holiday table! Make sure you check out the links below the recipe. When I have vegetarians attending my parties, especially at Thanksgiving, I want to create foods that are substantial enough for them to not feel that they are regulated to only eating side dishes. I want them to feel just as special as everyone else at the table. Be sure to ask what your vegetarian guests will and will not eat. Some vegetarians will eat dairy and/or eggs, others will not. A few will eat some seafood. It would be a shame to create a special dish and have them unable to eat it because you used an ingredient they can’t have. Creating a vegetable laden rice pilaf and serving it in a hollowed out baked squash, makes a very filling dish that is delicious, healthy, and flexible. This can be a two-for-one recipe. I like to make extra pilaf. Once you’ve filled the squashes, any leftover rice and vegetables can be stored in the refrigerator for meals the next day or added to your buffet as a side dish. If you want, you can add chopped turkey to it when you reheat it, making a single dish main course and a great way to help use up the leftover meat. Another benefit of this recipe is that you can make the components a day in advance and then reheat them before serving, melting the cheese over the top (if your guests can have it). This gets some of your work done ahead, reducing your load on the big day. I always love anything I can get done a day or two ahead (or even more) so that I can actually enjoy Thanksgiving and not spend the entire day in the kitchen. Food and wine pairing can be intimidating if you don’t serve wines often. Vegetarian dishes and poultry traditionally are served with white wines or lighter reds. I like to serve a chilled chardonnay or sauvignon blanc so that there is something for everyone. Hess is a fabulous winery in the Napa Valley (one of my favorites!) that has delightful whites and reds that your crowd will love. I recommend their Chardonnay to go with the turkey and vegetables. And if you have guests who must have a red, the Hess Cabernet Sauvignon is a delightful choice. Typically you will get about 6 (4-oz) servings out of each 750ml bottle of wine. Expect your guests to consume about 2 to 3 glasses per hour, helping you estimate how many bottles you will need. I always buy a couple extras so we don’t run out! And don’t forget to have non-alcoholic options for the younger folks and designated drivers. While we’re talking about holiday parties, I thought it would be helpful to have some guidelines on how much to serve to help you with planning! (Thanks to Dummies.com) Remember that people will want to have small portions of everything, so dishes will stretch farther when you have a large buffet or many options. Now get out there and have a fabulous Thanksgiving and joyous holiday season!! Use a heavy duty metal kitchen spoon to scrape out the squash. It will help cut through the strings, making this part of the job much easier. If you have one, a grapefruit spoon with a serrated edge is perfect and will make short work of this task. If you have ever struggled with trying to cut a hard large squash, like butternut, spaghetti or acorn, I have found that if I microwave it for just a few minutes, it softens the skin enough to make it easier to cut. You still need a very sharp long knife (preferably a heavy duty one like this one from Wustoff that I have) to give you enough leverage to get through it. If the knife is long enough, you can press on both ends, maximizing your strength. This recipe is naturally gluten-free! The only place gluten may hide is in the stock. If you have any doubts, make your own from vegetable scraps, cooking them down to make a beautifully flavored broth. To Prepare Squash: Pierce the rind a few times and microwave for 3 minutes. Using a very sharp large knife, cut a thin slice off each end (to help them sit flat) then split the squash in half crosswise (through the equator. Using a spoon, scoop out and discard the seeds and strings. Rub oil all over each squash half; lay them cut side down in a rectangular baking pan. Bake, uncovered, in the hot oven for 20 minutes. Flip them cut side up; sprinkle lightly with salt and pepper, and bake until tender when pierced, about 15 minutes more. Note: If you cut too deep and one or more of your squash halves have a hole in the bottom, you can plug it with a slice of zucchini or bell pepper. Place the "plug" in the bottom when you flip the squash over. Remove squash from the oven and let cool until you can hold them in your hand. Make the Rice Pilaf: While the squash is baking, in a saucepan, heat the stock and wine together until almost boiling. Keep hot over low heat until needed. Meanwhile, in a very large skillet, heat the oil over medium-high heat. When the oil is shimmering, add the seasonings, chile flakes, onions, garlic, ginger, bay leaf, chopped peppers, and carrots. Cook, stirring often, until onions are softened, about 3 to 5 minutes. Stir in the rice and cook, stirring often until it begins to color, about 8 minutes; make sure all the grains of rice get coated with the oil. Stir in the corn. Stir in the saffron and cilantro. Pour in the hot stock and stir to combine. Taste and add more salt if needed. Cover with a tight fitting lid, reduce the heat to low and simmer without lifting the lid or stirring for about 20 minutes. Stir in the zucchini and continue cooking until the liquid is absorbed and the rice is tender, about 5 more minutes (or according to package directions*). Move the pan off the heat, with the cover still on, and leave untouched for about 10 minutes. Remove the cover and fluff the rice with a fork. The zucchini will cook as the rice finishes cooking. Stuff Squash: When the squashes are cool enough to handle, fill with the pilaf, mounding the top of each one slightly. Place back in the baking pan. You may make the recipe to this point up to 1 day ahead. Cover with plastic wrap and refrigerate. Return to room temperature before continuing. Preheat oven to 350°F (if it isn't already hot). Sprinkle each stuffed pepper with some cheese (if using). Bake, uncovered, for about 10 minutes or until the cheese has melted, the rice is hot all the way through, and the squash is fork tender. Serve immediately or keep warm in a low oven. Sprinkle the tops with fresh herbs before serving. Yield: about 2 servings, depending on the size of the squash. * If you are using a type of rice that requires more liquid, add enough water to equal the total amount of liquid required on the package directions. This filling can also be used as a stuffing for other foods like bell peppers, or as a side dish on its own. If serving this as a side dish, you can omit the cheese if desired. By Jane Bonacci, The Heritage Cook © 2015. All rights reserved. To see our upcoming themes and how you can participate, please check out the schedule at Creative Culinary or contact Barb for more information. We have a core group of 12 bloggers, but we always need substitutes and if there is enough interest, we may consider adding additional groups. Disclosure: I received the wine from Hess as inspiration for writing about using wine during holiday entertaining. Let’s connect! If you ever need any entertaining or cooking advice, need to alter a recipe for gluten-free, or want recipe suggestions, don’t hesitate to email me. I can also be found at the social media site links on this page. This post may contain Amazon affiliate links. If you purchase a product via my link, it doesn’t cost you anything and I earn a tiny commission, which helps defray the costs of producing The Heritage Cook blog. Thank you for supporting me. Welcome to The Heritage Cook Family! Unauthorized use, distribution, and/or duplication of proprietary material from The Heritage Cook without prior approval is prohibited. This includes copying and reprinting content and photographs. If you have any questions or would like permission, I can be contacted here. Feel free to quote me, just give credit where credit is due, link to the recipe, and send people to my website. The suggestions here are not intended as dietary advice or as a substitute for consulting a dietician, physician, or other medical professional. It is the reader’s sole responsibility to determine which foods are appropriate and safe for their family to consume. The author makes no claims regarding the presence of food allergens and disclaims all liability in connection with the use of this site. Please see the Disclaimers page for additional details. That rice is so gorgeous, and this is a meal that I’d claim to be a vegetarian just so I could have it on my plate! That is a handy list to keep around during the holidays. Thank you so much Heather – I loved making and photographing it. Bright colors are always so fun! And I agree, this is one heck of a vegetarian feast that we all would stumble over each other to get to the head of the line, LOL. Jane, This dish is such a lovely combination of flavors and colors. With or without the squash, the rice pilaf is a perfect way to incorporate Middle Eastern flavor into an all-American Thanksgiving. Thanks Laura – I know it may be sacrilege, but I like throwing a surprise into every party and this flavor combination certainly does that, LOL. Happy Thanksgiving! Yum! I love the spice combination here. What a great addition to the table! Thanks Megan – a different flavor combo definitely wakes up our taste buds, LOL! Happy Thanksgiving! Oh, Jane, your rice filling sounds amazing. What a perfect option for vegetarian company, but I’d be happy with this for dinner anytime! Have a wonderful Thanksgiving!!! 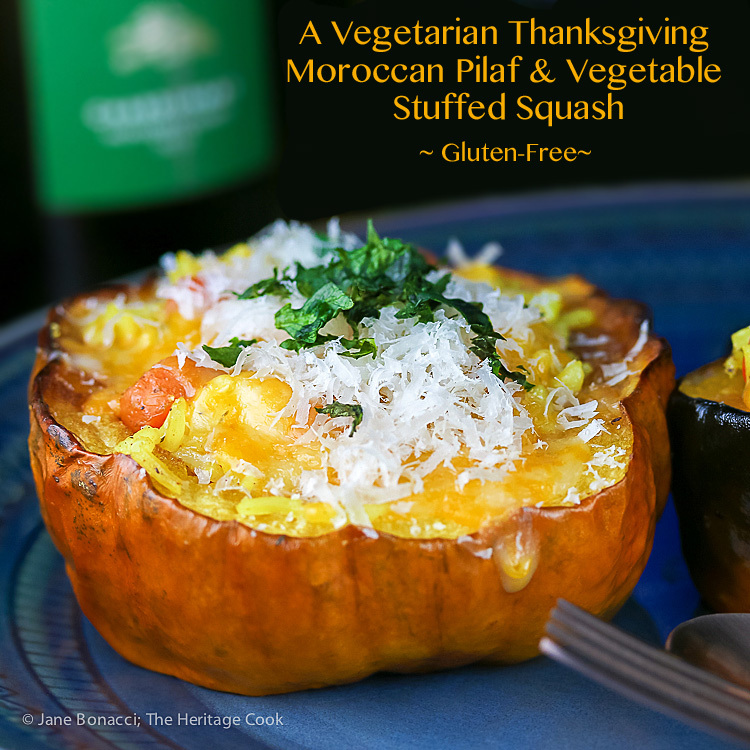 Oh I love Moroccan flavors and this is a beautiful side dish for the holidays! A great side dish with a roasted bird or as a main… for lunch! Beautiful! Thanks Jamie!! I wanted something fun and different that would be special as a main course for the vegetarians coming to our holiday table. I think they will love this – I know I do! 🙂 Hugs to you!! What a beautiful dish, Jane! And I like the add turkey the next day option, too. That’s a lovely, creative way to use leftover turkey! Thanks for the serving guide too. I am the worst at that, so it’s always good to have a guide to go by. I hope you and your family have a lovely Thanksgiving! Thank you so much Jenni! As I was making this is occurred to me that adding leftover turkey would create a whole new dish. I love it when that happens! 🙂 Have a fabulous Thanksgiving with The Beloved and all your wonderful fur babies!